Over time, vibraphonist Bobby Hutcherson grew to be one of my favorite jazz musicians. Were I to retrace my progression of favorites over the course of my discoveries as I navigated the landscape of 1950-1960’s Jazz, not only would this column grow upwards of 50,000 words, but it’s the kind of path impossible to rediscover. It’s not even a path, I suppose. The more one dedicates oneself to discovering new music, the more it seems like it’s everywhere… surrounded by it. Not a path so much as just wading into the middle of it all. But anyways, at some point, I grew to find myself tracking down anything with Hutcherson’s name on it. If I had to hazard a guess, it probably began the first time I sat down with his 1967 Blue Note Records release Oblique. I had already been familiar with Hutcherson’s work. In fact, one of the very first (perhaps, even, the actual first) jazz album I purchased was the soundtrack to Round Midnight, a movie that focused on an aging jazz musician (played by none other than Dexter Gordon), and featured the music and acting of many other jazz musicians (who, at the time, I was largely unaware of… hell, I was just a teenager when that movie came out). Later on, my teenage years behind me and a decent ways into my immersion into the jazz of the past century, I remember enjoying Hutcherson’s work on John Handy‘s New View, Joe Henderson‘s Mode for Joe, Eric Dolphy‘s Out to Lunch, Dexter Gordon‘s Gettin’ Around, and probably a couple of those Jackie McClean recordings that I had a brief infatuation with. Did I have any Hutcherson-led albums at this point? Hard to say. I’m pretty sure that Dialogue was the first one I scooped up, and I remember not being particularly drawn in by it. 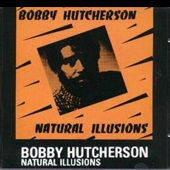 I also had this weird cut-out recording of Hutcherson’s called Natural Illusions, which left his hard bop and avant-garde sounds behind for an appealing 70s lite-jazz jaunty ambiance. What I liked about him then, and what I’ve always liked about him, is how Hutcherson is able to strike a near-perfect balance between his instrument’s need to emit a bop warmth and its undeniable charm for some avant-garde iciness. He was able to construct a sound that was simultaneously welcoming and fearsome. And when I heard Oblique, it drove both those points home with a masterful synthesis that still stops me cold in place when the album comes on. And shortly after that, I scooped up Happenings. This, too, can mesmerize on demand. And it was at about this time I went on a binge and purchased everything of Hutcherson’s I could find on the Blue Note label. Over time, I’d grab up other recording of Hutcherson’s, either on other labels or where he was sideman… notably, Billy Mitchell‘s excellent recording This is Billy Mitchell, and, tangentially, several Al Grey recordings, with my favorite being Snap Your Fingers. The two mentioned here come out at the start of every new autumn and winter. They’re ingrained in my life as much as the seasons associated with them. Hutcherson is still going strong these days. Over the last decade, he’s appeared on albums from the new generation of jazz stars, with Kenny Garrett and the SFJazz Collective being prime examples of collaborations that hit my personal radar. He also released a trio of recordings on the Kind of Blue label. Do I sound less enthused than earlier in this column? I guess I am, and therein lies my problem as I listen to Bobby Hutcherson’s newest release (ironically, on Blue Note Records), entitled Enjoy the View. I want the old Bobby Hutcherson. For those of you who were around back in the day when all this was going down, this is not a new experience for you. Many of you have been wistful for what was as those same musicians released new albums in subsequent decades. But remember, Round Midnight was my first real-time Hutcherson recording, and from there, over the course of twenty years, I was merrily immersing myself in his 1960s discography. For me, during the years 1992-2005, from a jazz music perspective, I was living through the decade of the sixties. Post-2005, when my attention slowly began to shift to the Jazz of Today, that’s the first time I came up for breath and had to evaluate Bobby Hutcherson’s Jazz of Today. His Coltrane tribute album Wise One was perfectly acceptable, and it was a nice change from the drowsiness of his previous release For Sentimental Reasons. That’s also an album that had its moments (“Ode to Angela” and “I’ll Be Seeing You” immediately spring to mind), but it’s not a recording I’ll ever grow sentimental for. More recently, Hutcherson released a live recording, Somewhere In the Night. I didn’t much care for his choice to pair his vibes with organ, but whatever, the album has some pleasant moments. And then I heard the news that he was going to be releasing a new studio album on the recently rebooted Blue Note Records label. This was news that had me sitting up and paying attention. I was ready to hear it right then and there. A new Bobby Hutcherson release on Blue Note Records… how great was that! Hutcherson’s newest features saxophonist David Sanborn, drummer Billy Hart, and organist Joey DeFrancesco (returning from Hutcherson’s previous recording). I want the old Bobby Hutcherson. I want the old Bobby Hutcherson on Blue Note Records. This album has its moments. The rendition of “Montara” is a stand-out track. The title-track to Hutcherson’s enjoyable 1975 release, the Latin jazz influence is stripped out, which on its face seems like a source of disappointment, but the new version maintains an alluring undercurrent of the original’s delicate nature that I find quite remarkable. “Hey Harold” lets the masterful Billy Hart carry the tune, and as a result, it’s the fiercest thing on this relatively soft recording. Both Hutcherson and, especially, Sanborn react favorably to Hart’s hard-charging lead and respond in kind. But there aren’t too many more moments than that. Hutcherson is still a joy to hear. And, please, don’t dismiss this album out of hand just because of David Sanborn’s presence. Yes, Sanborn is responsible for some of the over-produced schlock that typified some of the jazz of the 70s and 80s, but don’t forget that he had a bit of a turn-around and began putting out some decent stuff in collaboration with Bill Frisell’s crew… artists like Joey Baron and Don Alias and Greg Cohen and Frisell himself. Hal Wilner even got into the act with some production work. Also, Sanborn’s collaboration last year with keyboardist Bob James, Quartette Humaine, was generally overlooked despite being pretty damn good. Drummer Billy Hart is one of the best things on the scene today, and you could drop him and his drums into the middle of any collaboration, and he’s going to elevate it a notch or two. Joey DeFrancesco is a pro’s pro on organ, but I still don’t understand why anyone thinks this vibes-organ match is something to be pursuing. So much of Enjoy the View is devolved down to a groove-based set of tunes, and no matter how these compositions are constructed and no matter how well the musicians (DeFrancesco included) perform, there’s just no getting out of the viscous groove that organ is gonna lay down. When DeFrancesco provides something of an ethereal accompaniment, the tunes get a little air under them, but those times are few and far between. “Little Flower” veers into some serious contemporary territory, and, actually, that’s something of a relief to hear a syrupy melody instead of a thick groove. How am I supposed to deal with how much I want to hear more of the Hutcherson music that I grew to love and still go back to, no matter how hectic my listening schedule gets? It’s a tough position to be in, to want so much from the music, but getting something else. Because for someone like myself, relatively speaking, 1960 was just a handful of years ago. And if I put in Oblique right now, then right now it’s 1967. I feel bad for not raving about the new Bobby Hutcherson recording. I treasure his music and I am thrilled that he’s still out there performing and recording. I wanted his newest album to be something great. And the fact that it was on Blue Note Records upped my expectations even more. The new Blue Note Records, under the guidance of Don Was, has been putting out jazz that defies conventions, might not even be Jazz some of the time… but whatever, y’know, because categories and genres becomes less significant when the music is forward-thinking and, well, just plain solid. I was split between hoping that Hutcherson’s newest album would, also, go somewhere new, somewhere Today, with the other part of me hoping that I’d hear another The Kicker, a new Stick Up!, maybe even a nostalgic trip back to Oblique. Instead, this new recording sounds trapped in the nineties, caught between two extremes and unsure which way to go. It’s not a bad album. I’ve listened to it several times, will probably revisit it down the road. But I was hoping for so much more, and I feel terrible that I can’t post something enthusiastic. I really wanted to, but the music just wouldn’t let me. Maybe next time. Your album personnel: Bobby Hutcherson (vibes), David Sanborn (sax), Billy Hart (drums), and Joey DeFrancesco (organ). I agree with you that “Enjoy the View” is not Today, but is pretty close. It may not have all my heart but it has all my attention. There’s a lot of people who are enjoying it, including several whose taste in music I strongly respect. I tend not to review albums that I don’t think highly of. The amount of time that goes into writing a review, and then the extra administrative time utilized in getting it published, I figure why waste that on albums that I don’t think highly of, y’know? But I make an exception for artists whose body of work I feel strongly about. Hutcherson is one of my all-time favorites. As much as I try to approach each album on its own merits, there’s only so much subjectivity that can get filtered out. While I stand by my critique of “Enjoy the View,” and feel that it’s something of a disappointment, I’ll be the last to deny that my personal disappointment is probably coloring my professional disappointment a little bit. Thanks for stopping by the site. I recognize your handle from Twitter. Thanks for your time, Dave. Don’t get me wrong, I can see your article is deeply respectful; that’s one of the reasons I stopped to write some words. Maybe I’m under the SUBJECTIVE impression that your review is a little severe, but I think I understand why now (expecting something huge from someone this great). Anyway, a very interesting text as usual.